With 750m users, Facebook needs little introduction. But the one question I hear repeatedly at conferences and events is from marketers seeking practical examples of how Facebook can be leveraged to lure in cash from customers. So we’ve looked around, and dug out some of the most recent examples of Facebook being put into action for businesses. And here’s ten of the best. The agency responsible for this campaign was Miami Ad School Europe. And the client was online florist 1-800 Flowers.com. The basis of the campaign was the speed at which Facebook can help spread a person’s birthday wishes. It crowdsources friends to buy a flower each to create a bunch, which is then sent using 1-800 Flowers.com’s same-day delivery service. The birthday person’s friends are then taken to a micro-site where they can pick a flower and add a greeting. It should then become a full bouquet of virtual flowers, that by the end of the day become real. The principle is simple and can be applied to other businesses too. It involves encouraging lots of people to club together to buy someone special a nice present. That gambit was from the client, Belgian women’s magazine Flair, and the agency responsible was Duval Guillaume. The idea behind this Facebook app was simple: instead of tagging friends, you tag their clothes and accessories and the app lets you post a question asking where they got them from. The Flair Fashiontag Facebook app is all about helping people get inspiration for their wardrobe. Fashiontags are then displayed in the online Facebook Fashiontag gallery, and a selection is published in the print magazine. Though, it’s not entirely clear how much of a say the tagged friend has in whether they are featured in the gallery or the magazine. As with 1-800 Flowers.com, the principle behind Fashiontag can be applied elsewhere, such as retailers giving away items to those who are first to tag their names in a photo, just as Ikea did back in 2009. Or, it can be used by events who ask users to tag themselves in photos they’ve taken for the chance to win prizes. It’s often not that simple though, and Finnish agency Hasan & partners were mobilized by the KIASMA Museum of Contemporary Art in Helsinki to get people to put their words into action. Using the real critiques from discussion forums and newspapers as the basis, this campaign then added the slogan “Make a better one yourself then” and invited the public to upload their own piece of art to a Facebook gallery, which were then voted on accordingly. Around 600 pieces were submitted over the summer, and the campaign was designed to inspire positive debate on the subject of contemporary art. 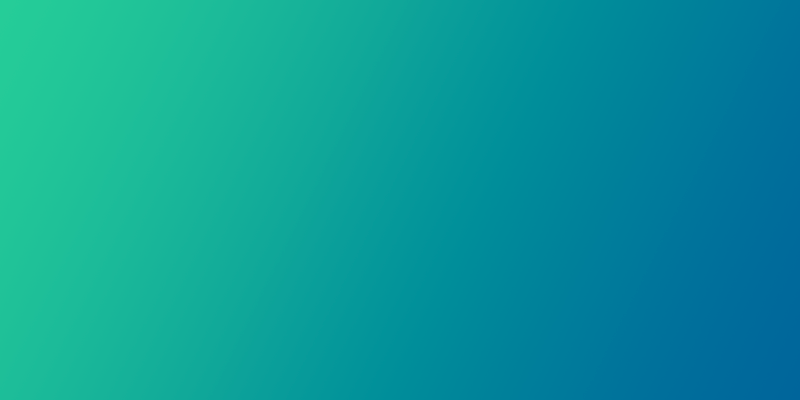 No apps were needed for this one, simple Facebook Pages were used, making this a relatively simple and cost-effective campaign to replicate, with a little bit of your own imagination thrown in for good measure. People like nothing better than putting their wits up against the so-called experts, so you could get people to submit their own photos, videos, stories, poems, logos, straplines…whatever may be relevant to your company. You can run a competition and let the community decide, or you can vote in-house. The agency here was New York-based Affinitive, and the client was Contiki Holidays, a travel company for 18-35 year olds. 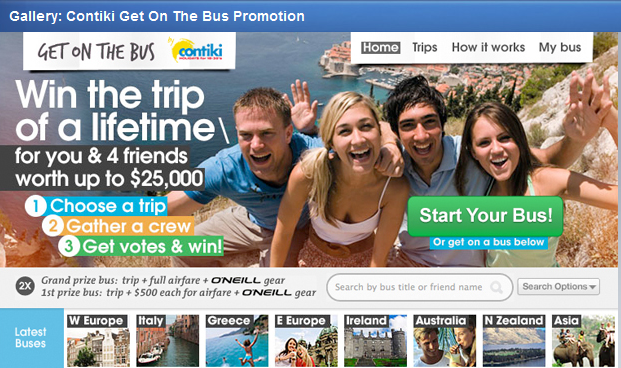 The firm wanted to raise brand awareness, and to reach a younger target audience they developed ‘Get On The Bus’, a Facebook app and competition that encouraged fans of Contiki to create their own dream trip, and invite four Facebook friends to join their imaginary vacation. They would then campaign for votes and attempt to win a $25,000 world trip. The app was designed to be personalized, which helped make the ‘game’ viral. So, the average age and gender breakdown of the passengers on each bus was shown, it also brought in the music, movies, likes, and interests each passenger had. Each ‘bus page’ enabled comments for friends to communicate and work out their strategy during the voting period. Contiki’s Facebook Page gained more than 10 million online impressions through Facebook shares, Likes, tweets, and additional coverage from across the social sphere. Last month we reported on a similar success story operated at Expedia, which managed to grow its Facebook fan-base by 750% in 6 weeks, surpassing the magical million mark. These campaigns show that personalization, competition and prizes can be combined to create viral, interactive Facebook campaigns. We covered this Facebook campaign back in May, but it’s well worth a revisit. The agency was Cosalux, and its aim was to help Deutsche Post increase brand awareness by tapping into the postal firm’s tradition of ‘delivering social memories’ and transposing this into the social, digital world. The app scans the user’s profile, using photographs and a myriad of statistics from across Facebook – including their friends – and then offers a printed book of data and infographics, costing around €20. There is also the option of outputting the content via the user’s news feed, which is free and which is what has caused this to go viral. Pereira & O’Dell, a San Francisco-based agency,was brought on board to help Corona build its Facebook fan base. Fans of Corona who ‘liked’ Corona Light on Facebook were invited to upload their photo to a 40-foot tall digital billboard at Times Square, which went live for a month starting in early November 2010. Corona then captured images of the billboard and posted them to Facebook, and the participants could then share their photographic evidence with friends. Such a campaign is obviously very viral, as it’s personalized and has high visibility. Of course, it’s also reserved for big brands with big budgets (despite what Corona says in its advert below), but the ethos can still be replicated elsewhere. Looking to promote your photography firm on Facebook? You can offer free introductory sessions to people in your vicinity, and upload the professional results to Facebook, tagging the user and thus helping to propagate your brand. Facebook is a great platform for massaging people’s vanity. Facebook doesn’t have to be all about commercial endeavors, as agency Walker Werbeagentur Zuerich showed with its engaging campaign for the Social Democratic Party of Switzerland. The objective was to circumvent disinterest, indifference and frustration in politics and get young people to realise that voting CAN make a difference. And this one didn’t involve any political bluster across the nation’s airwaves. The strategy involved the politicians being quiet, and listening to the people and produce results. A simple Facebook Page was set-up, where people could post their ideas on what they thought Zurich needed most – nothing dry like finances, taxes and legislation were encouraged. Ideas were posted, discussed and voted for using the like button. The 4 ideas with the most votes where then put into practice by the party’s 4 candidates who pushed them through parliament. So what does Zurich now have? A free city-wide WiFi network and cheaper public transport for starters. The party received an unexpected 30% of votes, and it was thus the most successful party. All 4 candidates were elected too. Facebook has 750m users, making it a fantastic way to canvas opinion. This could come in handy if you’re ever planning on running your own survey or market research campaign. With a small incentive thrown in for good measure, of course. 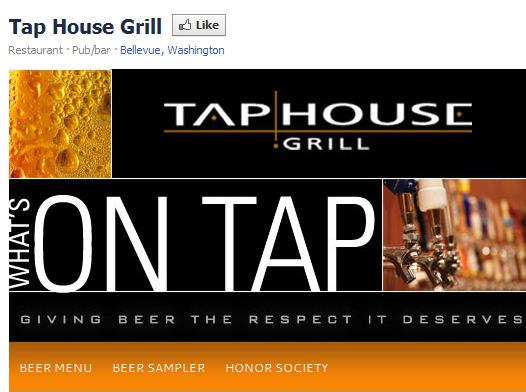 Creative Media Alliance helped Tap House Grill, from Downtown Seattle, create branded Facebook tabs for its 160-beer menu, with a happy hour specifically for their Facebook fans. The Facebook page and the website were closely linked, guiding visitors between platforms. The beer menu tab was the default landing tab for non-fans. This Facebook campaign generated an increase of 1,000% in active users during the week it was launched. This is a fairly straightforward campaign that’s easy to execute, in that it was a non-dynamic Facebook page that offered simple, special offers to customers in its local neighborhood. By encouraging people to ‘Like’ the page, it thus built up a following and could tempt them with further offers in the future. Agency Publicis E-Dologic helped Israeli fruit beverage brand Prigat gain significant leverage on Facebook, with its squeezing smiles machine. The world’s first online juicer was created, activated by users literally smiling. Visitors to Prigat‘s Facebook Page smiled at the webcam or uploaded a smiling photo. Using face recognition technology, the juicer squeezed orange juice and users saw their name displayed on the actual juicer. During the time the application was active, Prigat’s Facebook Page gained 30,000 new likes, and over 20,000 unique users uploaded their photos via the Facebook app. The gimmicky aspect of this secured the brand a lot of coverage in local newspapers, and the company gave all the squeezed juice to charity. This sort of campaign demonstrates that anything’s possible on Facebook with a little imagination. Sure, it’s not that practical and will require a lot of effort (and money) to set up, but demonstrating a real-world effect from actions on Facebook is something that can be used across many campaigns. The merging of digital and physical clearly works when executed well. Facebook is a social network, so it’s important to remember that organizations can use it just for that…networking. Invoke, a North American agency, was brought on board by The Iraq and Afghanistan Veterans of America (IAVA) to connect people with information about Veterans Day events across the country. The purpose of the Facebook app was to let people demonstrate their support of veterans to their friends through an online ‘March’ of support. The obligatory ‘Like’ was requested, then a customized Facebook landing page had a strong call-to-action driving users to join the March via their online status. Whenever a user subscribed to the app, they chose which state they lived in. This information was then used to create a leaderboard for each state, which helped create competition, interaction and build momentum. Gamification of the initiative was a key part. The app allowed users to subscribe and join IAVA’s virtual March by not changing their status for four days in November 2010, and it automatically posted a message on the user’s Facebook wall and Twitter homefeed. IAVA was promoted thanks to this campaign, and it gained 2,965 ‘marchers’ via their status updated.